An activist organization asked me to speak on their conference call last night about the Mercatus Medicare-for-All study. 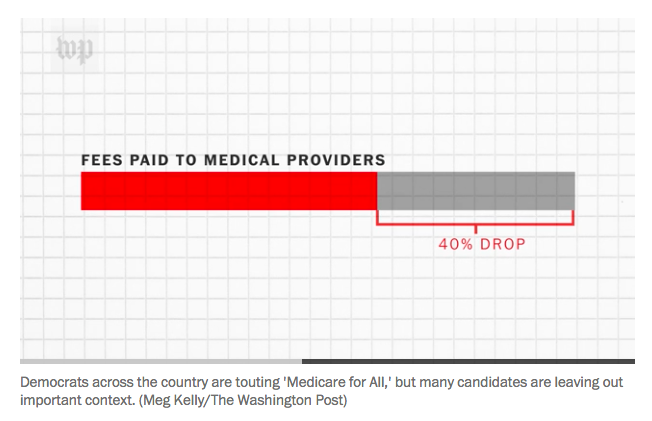 After I finished my opening remarks, one of the callers, a retired physician, told me that she had read Sanders’s plan would cut payments to doctors by 40 percent in the Washington Post. I told her that the Post had already corrected that mistake, but now I realize the Post continues to disseminate this falsehood in new pieces across its website despite already issuing a correction on it. On that same day, I immediately pointed out that this was a false statement. The Mercatus study does not say that Sanders’s plan cuts provider payments by 40 percent because it doesn’t. What the Mercatus study says is that Medicare provider rates are 40 percent below private insurance rates. This was cleverly worded to deceive readers into thinking Medicare for All would cut provider payments by 40 percent and Kessler was clearly so deceived. But the specific details of the report make it clear that the actual cut would be much less than 40 percent. This is because only 56 percent of Americans have private insurance. So, while private insurance patients would see their payments reduced by 40 percent, Medicare patients would not see their payments reduced at all, and Medicaid and uninsured patients would actually see their payments increase. In doing his research, Blahous decided to follow the text of the Sanders plan and assume that providers — doctors, hospitals, and the like — would face an immediate cut of roughly 40 percent for the treatment of patients now covered by private insurance. 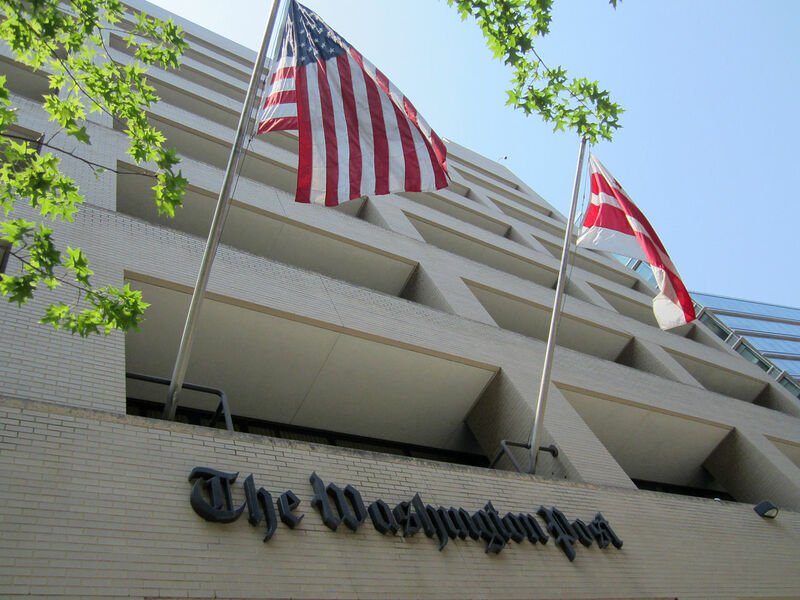 Despite acknowledging that this claim was false and issuing a correction about it, the Washington Post continues to publish it. Astonishingly, Glenn Kessler himself published another piece on August 10 with this exact same falsehood in it. Some Democrats have seized on a reference in a study released by the Mercatus Center at George Mason University, which receives some funding from the Koch Foundation, that a Medicare-for-all plan advanced by Sen. Bernie Sanders (I-Vt.) would reduce the country’s overall level of health expenditures by $2 trillion from 2022 to 2031. That’s because the Sanders plan would slash payments to providers by 40 percent. So, to repeat: Kessler acknowledged this claim was false on August 7 and corrected his piece about it on August 7. Then he republished the exact same falsehood on August 10. This August 10 piece has not been corrected as of the publication of this post. 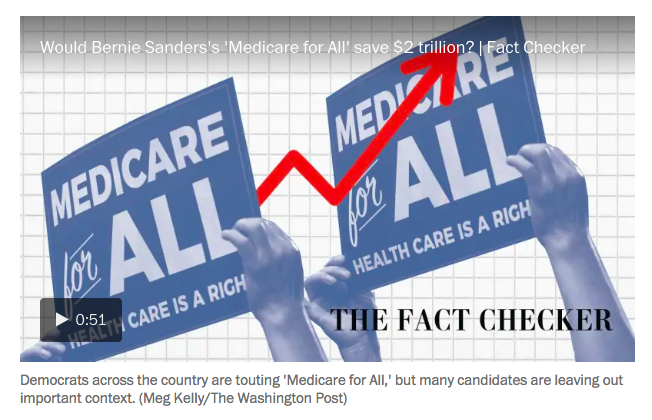 On August 12, the editorial board of the Washington Post published a piece generally bashing Bernie Sanders’s (completely accurate) descriptions of the Mercatus study. The text of the editorial does not say that Sanders’s plan would cut provider payments by 40 percent, though it does point out that Medicare payment rates “run at about 60 percent of private insurance rates” without also mentioning that Medicare payment rates are higher than Medicaid payment rates and higher than the often-nonexistent payments for uninsured patients. In order to generate the savings, Senator Bernie Sanders’s plan generously assumes that providers would be paid roughly 40 percent less than they are now. This is a completely false claim. Glenn Kessler acknowledged that this was a false claim on August 7 and corrected the piece he wrote making it. Yet here it is once again being published by the Washington Post. In some ways, the undead nature of this falsehood is a perfect microcosm of the problems our society faces in dealing with fake news. Once a false report is out there, it is devilishly difficult to undo the damage it has caused because, even if it is corrected, few people ever recognize the correction and so many people wind up repeating the false report. What’s remarkable is that this same dynamic can somehow be present within a major news organization and indeed within the same human being who actually made and then corrected the initial false report. Needless to say, the Washington Post needs to correct Glenn Kessler’s August 10 piece and needs to correct its August 12 editorial. The video also needs to either be remade with a different voiceover and graphic or wiped off the website entirely.